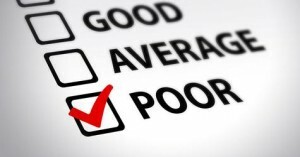 Home › General › What to do if you receive a poor service? What to do if you receive a poor service? Proving that a product you have purchased is not up to standard can be easier than proving that a service you have received was not good enough. As a physical entity, a product can be tested and checked against its description. By contrast, once a service has been provided, there might be records of what has happened but the actual service provided will be intangible and often difficult to assess. Professional services such as those offered by accountants, lawyers or estate agents are also more difficult to assess than others that might leave some form of physical trace. For example, it is easier to determine objectively whether a transport service or a technical repair service has achieved the expected outcome. Legal services are particularly difficult to judge. They can also take a huge variety of forms, from the most common services such as advice on buying a home or help during divorce proceedings, to lesser known areas of the law such as notarial services (see, for instance, www.vpnotaries.co.uk). In order to protect the rights and interests of the consumer or service user, professionals are often subject to regulations that any individuals or firms practising a particular profession must follow. For instance, in England and Wales all solicitors are regulated by the Solicitors Regulation Authority. This regulator publishes a code of conduct that all solicitors must follow when providing their legal services. Solicitors who fail to adhere to the code of conduct can face sanctions, including being struck off in the worst cases. Apart from regulatory bodies, many professionals are members of professional associations, such as the Law Society for solicitors or the Institute of Chartered Accountants for accountants. Professional associations are not regulators but they can impose certain conditions on their members. Often, membership of professional associations is optional (e.g. accountants in England can choose between several different professional associations or can also remain independent). Although professional associations exist to further the interests of their members, they often have a general aim to maintain the profession’s reputation. As a result, they often have in place rules for the benefit of the consumer, such as complaints procedures that their members must follow if they become the subject of complaint by a member of the public. If you have received a poor service from a professional firm, try first to speak to the firm and follow their internal complaints procedure. If you are not satisfied with the outcome, check what professional association they are members of and who is their regulatory body, as these entities should be able to give you information on your different options. In some sectors, there are also schemes designed to reach an independent decision where a member of the public feels that the standard of service has fallen below a minimum. A good example is The Property Ombudsman, an organisation that oversees estate agents and their relationships with landlords and tenants. It is not compulsory for estate agent companies to subject themselves to the scheme, but they are encouraged to do so and it brings good reputation to the firm, as it tends to show a commitment to transparency. The ombudsman can act as an arbiter and make decisions in disputes between estate agents and individuals. All these options are there to guarantee some minimum standards of service. Quality of service can be very subjective and a professional can be compliant with the relevant code of conduct and still provide what some people might perceive as poor service. If you think you have been mistreated by a professional firm, try first to gather different views and look at the situation from an objective point of view. Make sure you keep records of any e-mail communications and other paperwork exchanged with the firm in question. Try a friendly resolution before asking the firm to initiate their internal complaints procedure. If the issue is not resolved, check the information offered by the relevant regulator and professional body. If you know any other professionals in the same sector, they might be able to give you some valuable information on your rights and options. Finally, there is easily accessible Information online about the different ombudsman schemes and you can also try to contact your local Citizens’ Advice Bureau for advice. June 23, 2014 What to do if you receive a poor service?